It is standard practice to show appreciation to baby shower guests by sending them home with small party favors and gifts. Not only does this make the event more memorable, but they also get to take some of the fun and memories home with them. Now, baby shower favors do not have to be ridiculously expensive. 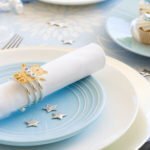 If you have a limited budget, you do not have to go way over your financial limits in order to impress guests. Creativity and resourcefulness can be used to come up with memorable baby shower party favors that are budget-friendly. Candies, lollipops, and chocolates of different varieties can be packaged creatively and given out as favors. Plus, who doesn’t love to leave a party with some sweets to take home? Personalized Chocolate Bars – You can order personalized wrappers to wrap your favorite candy or chocolate bars with. These make adorable and delicious baby shower favors ideas. 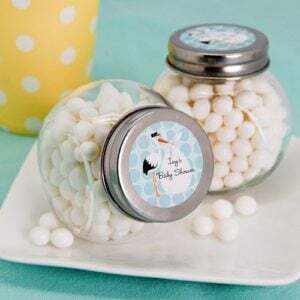 Baby Shower Candy Jars – The lids of candy jars (you can choose different sizes) can be personalized with baby shower details or guest names. You can get one kind of candy to fill up the jars, or use assorted varieties. Baby Shower Candy Jars from Beau-Coup. Glam Jelly Beans – Fill up clear tubes with different colored jelly beans. Easy to do yourself, and very cost-effective. 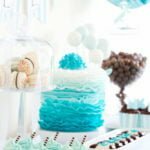 Since baby shower parties are a more popular activity among mothers, why not give out party favors that women generally like? Bath Soap Baskets – Different varieties of bath soaps can be wrapped in baskets, decorated with ribbons and colored paper, and handed out as party favors. Blue or Pink Nail Polish – Give your guests the gift of DIY Mani’s and Pedi’s! Around each nail polish, tie a little note to say “Thank You” and add a bow to make it extra cute. Spa Goodie Bags – Reusable tote bags can be filled with body wash, body lotion, bath scrubs, and other bath accessories. Spa goodie bags also make great baby shower game prizes! One of our favorite baby shower favors ideas are for the home, because you and your guests can enjoy them long after the shower ends! Scented Jar Candles – Candles are one of the most popular baby shower favor ideas. Pick a subtle scent, like vanilla or cucumber melon, so you know your guests will enjoy them! Jewelled Picture Frames – 4 x 6’s picture frames don’t have to cost you a lot of money, but will look like you did! To make them more personalized, include a picture of the parents-to-be in each frame! Heart-Shaped Measuring Spoons – You can also find these online at various baby shower favor websites. Definitely a cute baby shower favor idea for the baking bunch!